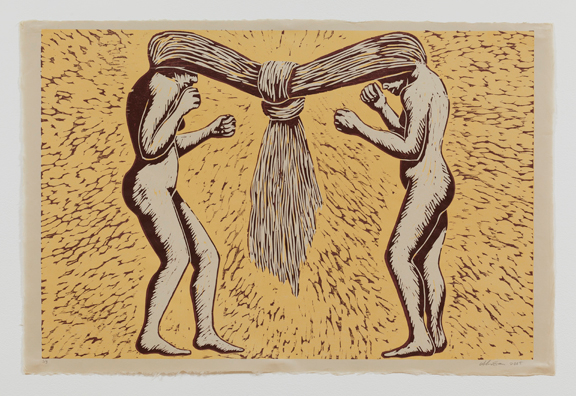 Impress your friends with five fast facts about sculptor and printmaker Alison Saar (b. 1956), whose work is on view in Alison Saar In Print through October 2, 2016. Saar grew up surrounded by art, thanks to her mother, the renowned collagist and assemblage artist Betye Saar, and her father, Richard, an art conservator and painter. Saar’s opened her eyes to art making and deepened her interest in other cultures. Saar often incorporates found objects into her artwork. She credits childhood visits to Watts Towers with inspiring her practice by showing her that anything could have a second life. She enjoys working with materials that have a history. Because Saar’s work often explores dark or disturbing themes, she adds levity by incorporating wordplay and double entendres into the titles of her works. She relates this method to the blues. “They’re playing these heart-wrenching songs, but there’s also some humorousness to them, some sort of escape,” says Saar. Saar cites her identity as a biracial woman as an influence in her artistic practice. She often tackles the concept of duality in her work—themes like freedom versus oppression and humor mixed with despair. When asked how people should interpret her work, Saar replied, “Just look at it.” She believes that she only does half of the work on each piece. The viewer completes it by bringing his or her own history and perspective to the interpretation of Saar’s art. Visit the museum to see Alison Saar In Print before the exhibition closes on October 2, 2016. —Hannah Page was the summer 2016 education intern at the National Museum of Women in the Arts. 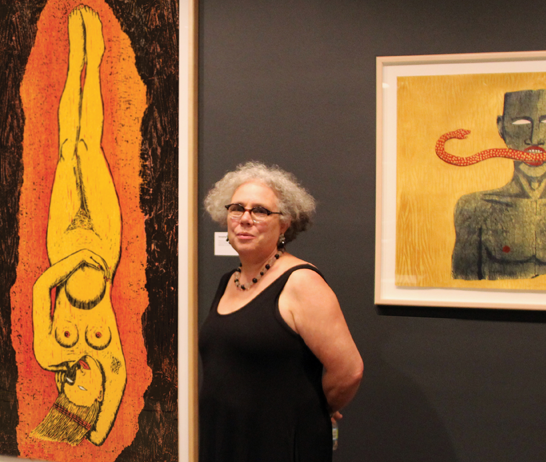 This entry was posted in 5 Fast Facts, Artist Spotlight, NMWA Exhibitions and tagged Alison Saar, Alison Saar In Print, woman printmaker, woman sculptor by Women in the arts. Bookmark the permalink.